My first attempt at this project was an open box form with strips of aluminium sawn to different lengths and standing up in the box. I thought it was a bit quirky and interesting. The box was textured with a tear away pattern and was also a bit quirky being higher at the back then the front. The evaluators weren’t impressed! “This piece meets the requirements but only in a literal way. It includes aluminium nails (I think) and a cold connection of sorts (epoxy) but I see no reason behind it. 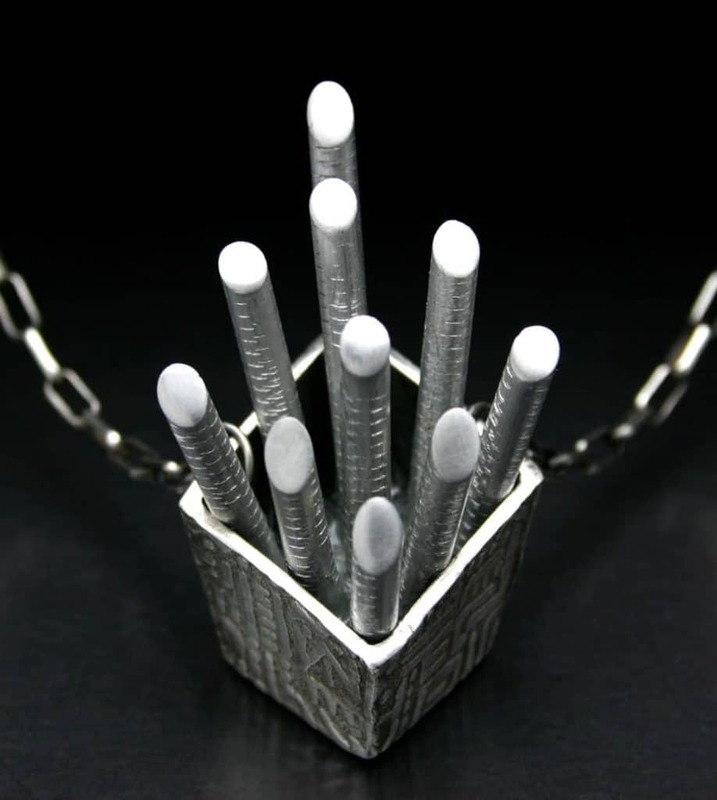 The rods are not interesting and they compete with the metal clay box. Why are there ten of them? Why are they angled at the top? Why this long?” Because I like it that way! Not sure what the purpose of these ridiculous questions is. I can’t answer them, there was no mechanism for me to explain my choices at this time in the Registry evolution. “The piece hangs awkwardly and sends vibes of pricly (sic) danger. This in another piece might be a central point, but here it is merely annoying” Not sure why it’s annoying in this piece but wouldn’t be in another piece! My second attempt was a ring with a sea theme. The white metal part was a pewter coral component which sticks out from the other elements. 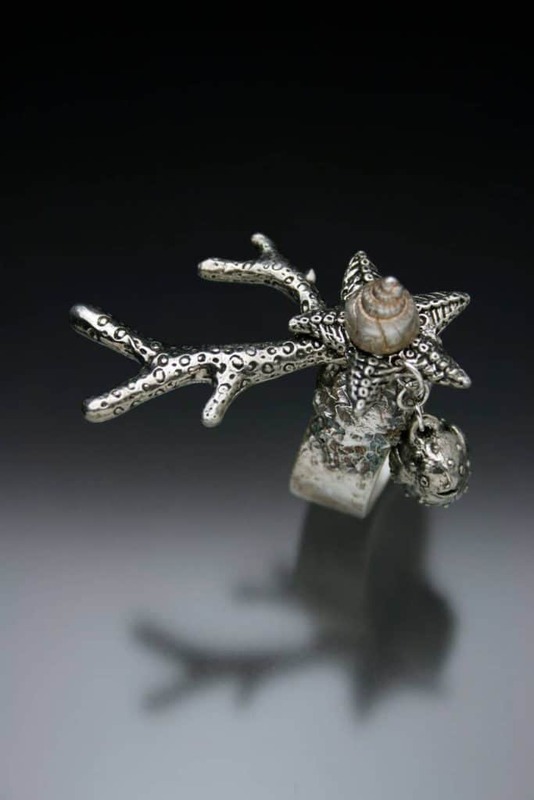 All the elements in this piece was connected with a bolt embedded in the top of the ring. The nut was embedded in the shell at the top. All the elements were threaded onto the bolt and then the nut was screwed onto the top to create the whole piece. 6.5, so close! Only one paragraph of comments. 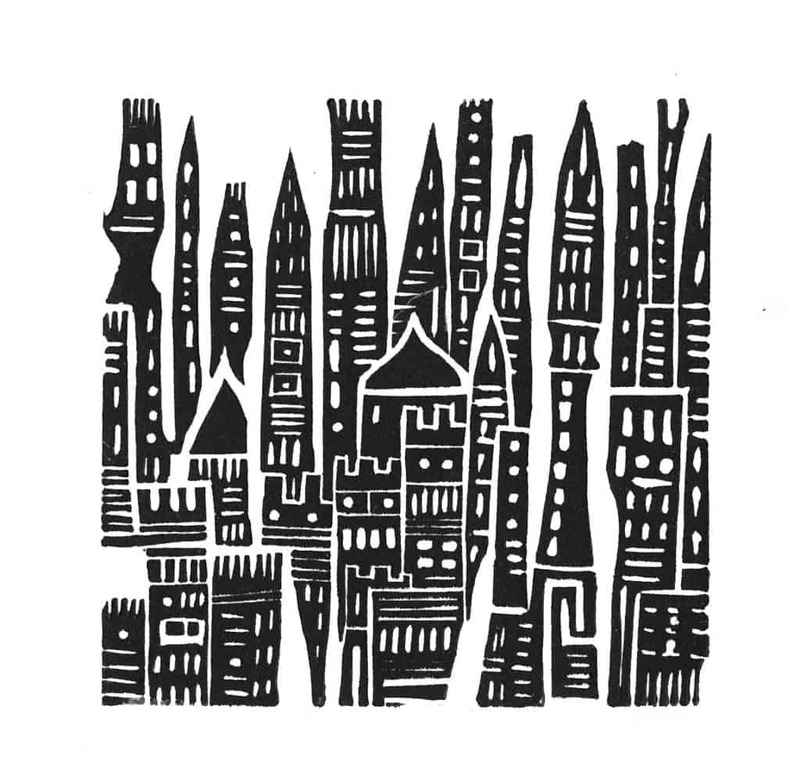 I love lino carving and I’d made several prints of cityscapes –sort of fantasy cities which I find so therapeutic to carve. Using lino is a really freeing medium as it’s so cheap and if you make a mistake, it doesn’t matter. I never plan or draw what I carve in lino. Designs just develop as I carve and I can get totally lost in the action of carving these cities. ​I made a tear away texture of one of the lino prints and then created the front piece but cutting around the buildings and piercing out elements so you could see the heat patina on the titanium sheet. 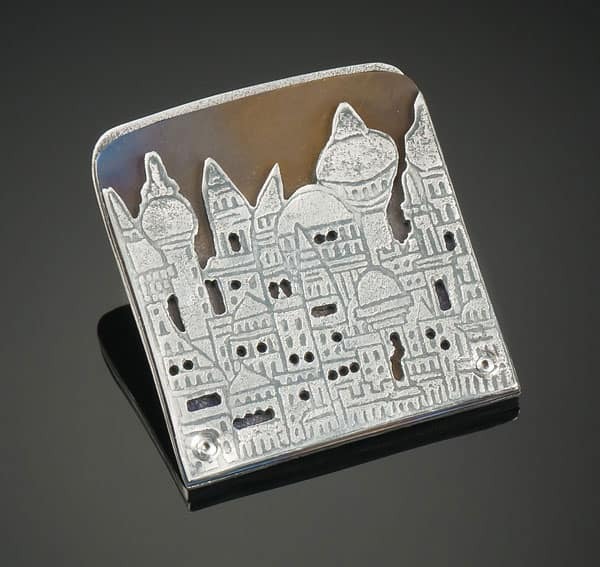 The back is a solid piece of silver with a pin embedded. It was riveted together. ​This was the second one of these I made as the first one wasn’t so successful. I didn’t bargain for the effect of drilling holes in the titanium changing the heat patina. The heat of the drill changed the colour of the patina so I used less heat on the titanium before drilling the holes so the slight change in the colour would work with the intention of the design. 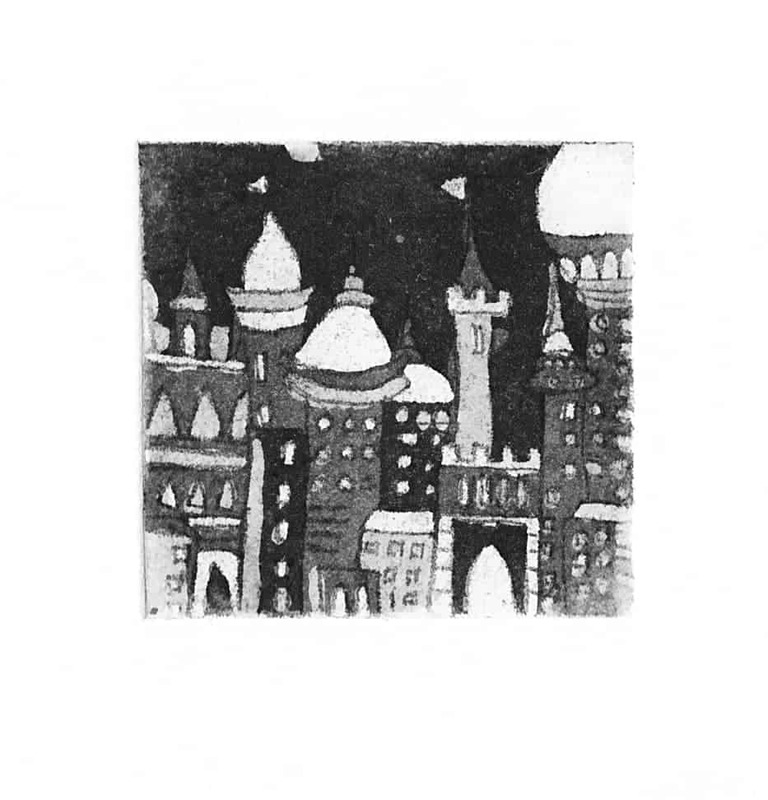 This piece is called ‘Night City’. “The pin stem is crooked.” Wasn’t when it was put in the package so I’m not sure how that got bent! This was one of the first evaluations where they segregated the primary and secondary evaluator’s comments. Here are the comments from the secondary. On the left are a couple of my prints. a piece that also includes metal clay. 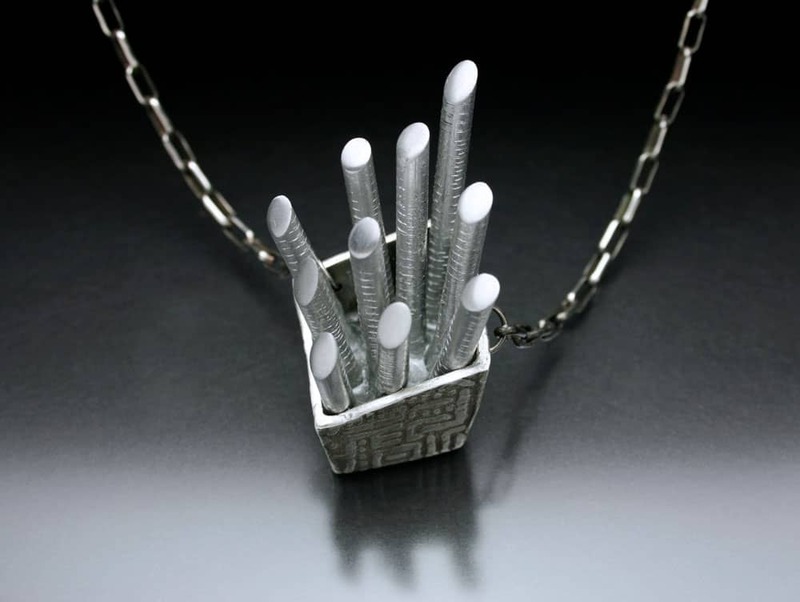 The purpose of the project is to experiment with these metals and the techniques particular to them.